Scottsdale, Ariz. — August 23, 2016 — vCORE Technology Partners, an IT solutions and services provider operating in the U.S. and Canada, today announced that Inc. Magazine has ranked the company as the No. 1 fastest-growing IT services company in North America in the over $50M category, landing at No. 620 on the overall list. The exclusive annual list of America’s fastest growing companies, represents the most comprehensive look at the most important segment of the economy — America’s independent entrepreneurs. Companies such as Microsoft, Dell, Yelp, Pandora, Timberland, LinkedIn, Zillow, and many other well-known names gained early exposure as members of the Inc. 5000.
vCORE has created a premium brand in a crowded industry through its unwavering dedication to quality, providing highly secure IT infrastructure platforms, an array of value-enabling services and a very high level of personalized support, 24/7/365, for each and every Client. 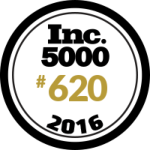 The Inc. 5000 list stands out where it really counts, according to Inc. President and Editor-In-Chief Eric Schurenberg. vCORE Technology Partners is an IT Solutions and Services Provider focused on providing hypersecure IT infrastructure platforms for a hyperconnected world. With a deeply held belief that successful companies should be a force for good in the world, vCORE has integrated community service into every aspect of its business. Learn more at www.vcoretec.com.